Physical Description: Well-built with a large lower half. Young face, but physically mature for his age. Room to fill out in his upper body. Not a great athlete, although surprisingly athletic for his size. Will need to watch his conditioning as he matures. Hit: Fluid, easy swing. Natural hitter. Strong, quick wrists. Future plus hit tool. Easy plus bat speed and an advanced approach for his age. Solid swing mechanics and separation in stride. Very controlled for someone with his bat speed and ability to drive the baseball. Able to recognize spin, and has decent knowledge of the strike zone. Can let the ball get deep on the outer half and still have the strength to drive it the other way. Power: Plus-to-better power potential (30-plus home runs). Present strength allows him to drive the ball to all fields. Will still get stronger. Ball makes a different sound off of his bat and really carries. Generates natural backspin and loft. Has displayed precocious power to all fields ever since signing. Arm: Plus arm strength that can play at third base. Footwork has greatly improved since he signed, but still can get a bit sloppy at times. Has the arm strength to make all the throws both deep behind the base and charging while on the run. Field: Has soft hands and his footwork is surprisingly good given his build. Comfortable charging the ball and making smooth transfers from glove to throwing hand. Agile for his size and has average range. Given time, projects as an average defender at third base. Speed of the game could give him some trouble while he adjusts to the major league level, which could take time given his age. On occasion will lose fundamentals leading to careless errors. Should be able to stick at the position long-term unless his body gets away from him as he matures. There was concern in the lower minors that he may need to move off the position, but this stemmed almost entirely from projections that he may lose agility as he grew into his large frame, rather than from anything relating to his fielding ability. Run: Below-average speed at present. Not a part of his game. Has shown solid baserunning instincts, but can lose focus and make the occasional blunder. Career Notes: Suffered a stress fracture in his right ankle while sliding during the 2014 Fall Instructional League. Was one of the top prospects in the 2013 international free agent class. Participated in 2013 and 2014 Fall Instructional League. Summation: All-Star potential regardless of position due to his value at the plate. Potential to be a plus hitter for average with plus-to-better power. One of the most exciting young players to come through the system in years. Mature approach for his age; has shown the ability to handle aggressive assignments and make adjustments to periods of struggle. 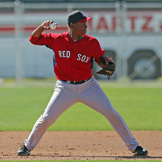 Glove will play at third base with more experience. Surprisingly agile given his build. Will boot some routine plays but will some of the tough ones. Unlikely to be a Gold Glove candidate, but also won’t be a liability and should develop into at least an average third baseman, an outcome the Red Sox will happily accept given his offensive potential. If a defensive move is necessary his bat will still play at either first base or designated hitter.